The report card for Brisbane property continues to impress…straight A’s are becoming the norm for this leading investment location. Brisbane looks set to continue its top of the class status with the latest report from CoreLogic Data commissioned for the Real Estate Institute of Queensland (REIQ) confirming that Brisbane is the fastest selling area in Queensland. Even better, Brisbane achieved the highest increase in median house values for the year ending March 2015. When it comes to yields in the Brisbane region, the results from CoreLogic indicate Massland developments are smack bang in the hottest locations. The report found that Boronia Heights had the Brisbane region’s highest rental yield at 9.1 per cent over the year to February…absolutely fantastic news for our investors in Bounty at Boronia. 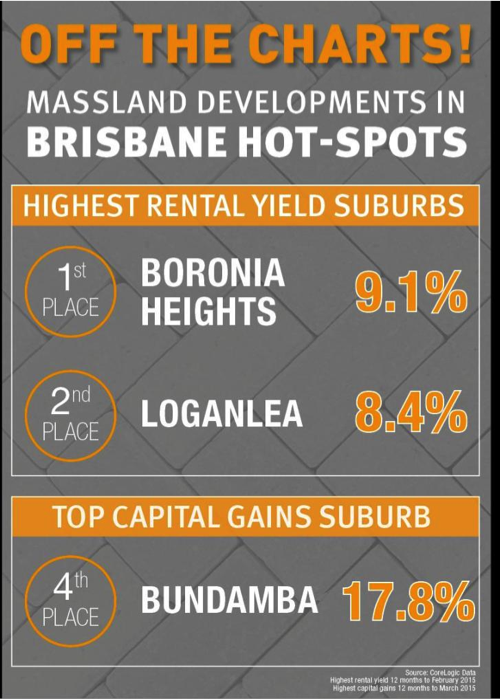 The good news continues for Massland investors with Loganlea achieving the second highest rental yield in the Brisbane region with an impressive 8.4 per cent. Of course, these results are no surprise to Massland. Our strategy of honing in on the most lucrative investment locations continues to pay off. These high achieving suburbs tick all the boxes…high growth population, easy access to the CBD and a comprehensive offering of quality amenities such as schools, retail stores and recreational facilities.